Perhaps the worst insect pests that attack rhododendrons are the several species of weevil, found in nearly all areas of the world. Weevils attack over 100 different plant species in addition to rhododendrons. They attack yews (Taxus), hemlock (Tsuga), strawberry (Fragaria), various vines and flowers and even potted houseplants. In the Pacific Northwest, weevils also feed on salal (Galtheria shallon) and huckleberry (Vaccinium). The most common and most significant of weevil species are: black vine weevil, Otiorhynchus sulcatus; obscure root weevil, Nemocestes incomptus; woods weevil, Sciopithes obscures; strawberry root weevil, Otiorhynchus ovatus; rough strawberry root weevil, O. rugosostriatus; obscure root weevil, Sciopithes obscures; clay-colored weevil, Otiorhynchus singularis; and (no common name) Dyslobus ssp. Collectively all of these species are commonly called root weevils. Varying in length from about ¼ inch (0.6 cm) to ½ inch (1.3 cm) long, they have a short broad snout with antennae attached. They vary in color from slate gray to blackish brown and generally have some small yellow or white flecks on their backs. The obvious indications that there are weevils present are the conspicuous notches around the edges of the leaves of the plant. These notches can be few or in some cases so extensive that the entire leaf edges end up being jagged and very unsightly! Usually the damage is aesthetic and plant health is not in jeopardy. The plants may have only a few notches in some leaves; however, many plants do end up with their leaves extensively chewed. In container grown plants, the damage can be particularly bad, and an infestation in nurseries can prevent plants from being saleable. There are some plants that are particularly susceptible including 'Blue Peter', 'Elizabeth', 'Ruby Hart', 'Creeping Jenny', and 'Scarlet Wonder'. Less susceptible varieties attacked include 'Sappho', 'Sir Charles Lemon', 'Pink Petticoats', 'Golden Torch' and Nobleanum Album Group. Generally, hybrids are more susceptible than species; however, among the species I have observed with weevil damage are R. piercei, R. campanulatum, R. chaetomallum, R. degronianum var. heptamerum and R. celebicum. Young new growth is the particular foliage of choice. Thinner foliage is more susceptible than foliage that is thick. Leaves that are recurved at the edges are bothered less. My observations do not indicate that indumentum is any deterrent. Weevils are nighttime feeders, so spend the day in the loose ground, mulch or leaves beneath or near the plants. The adults are wingless so do not fly but crawl from plant to plant, container to garden and even garden to garden. If gardens are adjacent to woodlands, they will travel from there into the plant beds. Because they feed and develop on a variety of plants (especially salal or huckleberry thickets), infestation can come from many directions. Weevils must crawl up from the ground or from adjacent plants or structures into the plant to feed. The adults emerge from pupation chambers in May to June and feed on foliage from twenty-one to forty-five days before they lay their eggs. All root weevils are apparently egg-laying females. There have been no males found in the United States. They generally feed on new or current year growth. Weevils emerge in the spring over a four to six week period and then feed for another four weeks or so before beginning to lay eggs. They lay several eggs each day into the soil or leaf litter. Adults live for ninety to one hundred days and may lay up to two hundred eggs in this time. The eggs hatch in two to three weeks to larva. The not so obvious damage caused by the weevils is from the larvae which are white grubs. 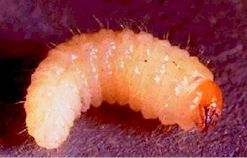 These grubs live in the soil and feed on the plant rootlets and stem at the base of the plant. The damage caused by the larvae can kill plants and are particularly damaging to container grown plants. Complete girdling of the stem and/or fatal root damage can occur. The larvae are C-shaped and legless as shown above. The color is dirty white with a dark head. They grow slowly over the summer, molting five to six times. By late fall they will be about 5/8 inch (1.6 cm) long. Winter is spent in the soil in and around roots. The change from larvae to adult is pupation. Pupation takes place in the spring when the soil warms up. The pupae are about the same size as the adult and are white. They are soft and have the outline of the parts of the adult weevil. Pupae are inactive and do not feed. The damage caused to the roots by the larvae generally is not life threatening to the plant unless it is in a pot. In some species, the winter may be spent as adults; however, they are inactive during cold weather. Milder winters encourage this over-wintering. There is an overlap in different stages of growth in woods weevil. It is possible to find adults, larvae and pupae all at one time in one location. The greatest numbers of adults of all species occurs in late autumn. The life cycle begins anew in the spring when the adult weevil emerges. • Keeping plants healthy and happy is always the first line of defense. Stressed plants suffer damage more often than happy plants and seem to attract pests of all kinds. Proper watering, a mulch to retain moisture, fertilizing appropriately and good housekeeping will help. • Pruning off the lower leaves that touch the ground, structures or other plants will reduce access to the plant. PHYSICAL CONTROL. Determination of the proper time to begin physical or chemical control can be done by observation. At night and sometimes after sundown or on cloudy days the weevils can be found on the leaves or hidden somewhere on the plant. A white cloth can be spread beneath the plant and the branches shaken to dislodge the weevils. They will fall on the cloth where they can easily be seen. Observations should be made frequently (once a week) when the weather warms or in early May in the Northwest. New leaves can be observed for damage as the growing season begins. Weevils can be picked from the leaves and plant at night if one has the patience and is willing to spend time well after dark with a flashlight. Close examination will reveal the weevils, and they can be picked or scraped into a container for disposal. Because the weevils must travel up into the plants, it is necessary to spend some time looking and they may not be visible early in the evening. During a recent hunting trip I picked seven weevils from plants in a short span of about fifteen minutes. Although I have been able to use this method with some success, I confess I become weary of the late hours and do not spend the time I should to really have an impact on control! Sticky barriers such as Tanglefoot, Tangletrap, Tack Trap or StickEm will prevent adult weevils from traveling up the trunk to the leaves. These barriers must be applied to the trunk so there are no unprotected avenues of travel up the stalk. The weevils either will choose not to travel up the stem or will become stuck in the barrier and thus cannot move into the canopy to feed. There are some indications that prolonged use of these materials can be somewhat damaging to the bark and stem, so a strip of polyethylene, waterproof tape or thin plastic can be fitted tightly to the stem and the sticky material applied to it. Plastic tape, etc. , must be removed before stem growth is restricted. The barrier materials can be difficult to remove from hands or tools. Flat sticks can be used for application and then disposed of. Paint thinner may be required to remove these materials from tools. This method of control will not work if there are access routes other than the stem to the plant such as other plants, fences, etc. Teflon barrier tape such as SureFire Insect Barrier Tape can be used in place of sticky barriers. The tape must be wrapped snugly around the trunk with the sticky side adhering to the bark leaving no avenue for the weevils to crawl under it. Make sure that you do not constrict plant growth. Another disadvantage of these products is the fact that the tape is white and so is visible on the plant. Traps can be made from burlap or coiled corrugated paper and placed under plants. Take burlap and make folds in it as you place it at the base of the plant. The weevils will hide in the burlap or paper during the day and can thus be trapped. Before the weevils move into the plants in the evening, the traps can be removed and the weevils destroyed. CHEMICAL CONTROL. Chemical control for weevils should be used with extreme caution and only as a last resort! Some of these chemicals will kill beneficial insects such as predacious ground beetles and bees. Chemical sprays should never be sprayed on flowers. Be sure to check to see what chemicals are registered or are permitted in your area for use as a control for weevils. When using pesticides, follow all label instructions and apply only as directed. Use proper protective masks and safety equipment per directions and as appropriate. Store pesticides in their original containers and keep out of the reach of children, pets and livestock. Always read labels before using. Insecticides work the best on adult weevils and are normally applied to foliage. Timing is very important, or the spraying will be worthless. Foliar applications should begin at the first appearance of adults in early summer and must be reapplied regularly (according to label instructions). All available insecticides have a short residual activity (three days to three weeks depending on which one is used). Foliar insecticides that are used in the Northwest and have been registered for weevil control include azadirachtin (Azatin EL), acephate (Orthene), bendiocarb (Turcam), bifenthrin, (Talstar), chlorpyrofis (Dursban, Pageant), and cyfluthrin (Tempo 2). A recent visit to a large warehouse store in the Northwest found Orthene, Bug-B-Gone Dust, Lindane 20 and Tempo 2 on the shelves with their labels listing weevils as one of the insects controlled. Azadiractin is a growth regulator. Pyrethroids (Talstar and Tempo 2) may be repellent, particularly at low application rates, but weevils may simply move to untreated areas. Coffee grounds spread around the base of plants will deter weevils. The disadvantages of this control are the amount of coffee grounds required for large plants or many plants and repeated applications. 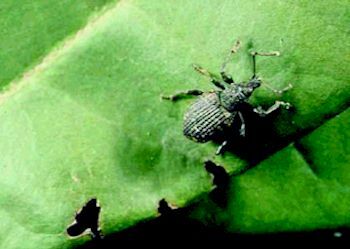 The author has used this method on a single plant with some success, only to see the weevils return the following year. The coffee grounds are a good mulch but will add to the acidity of the soil. Some may not like the color of the grounds and a thick covering may become moldy. BIOLOGICAL CONTROL. Biological control is non-chemical and is not toxic to plants, humans, pets or beneficial insects. Beneficial nematodes are a biological control that is a relatively new pest control product. They are effective against a number of serious pests that live in the soil, including weevil larvae. Several nurseries have begun use of beneficial nematodes as an effective control measure for weevils. Nematodes are simple roundworms and are colorless, unsegmented and lack appendages. There are free-living, predaceous and parasitic nematodes; however, the beneficial species of nematodes that are insect-parasitic and possess the biological control attributes for control of weevils are in the genera Steinernema and Heterorhabditis. These nematodes are multi-cellular metazoans. Nematodes are formulated and applied as infective free-swimming juveniles. This is the only free-living and environmentally tolerant stage of the above genera of beneficial nematodes. Infective juveniles range from 0.4 to 1.1 millimeter in length. When a host (weevil) is found, the nematode enters into the insect via a body cavity. Once inside, a bacterium is released which multiplies rapidly and causes death to the weevil. Unlike chemicals, nematode applications do not require masks or other safety equipment to apply. Nematodes do require specific conditions to be effective. A specific temperature range (soil temperature must be above 55 F, 13°C) is required. Because the nematodes are free swimming, the ground must be moist. It is advisable to apply water before and after applying. Applications must be made in accordance with the date listed on the container and application rates must be strictly adhered to. Beneficial nematodes are not found naturally in the soils of most areas, so must be applied yearly. They are only effective against the larvae, and the most beneficial time for application is in the fall. Applications in late summer can only be effective if there are larvae present. Some of the commercially available brands are BioSafe, Exhibit, Biovector, Nemesis and Scanmask. These products can be found in many garden stores and through mail-order catalogues or on the World Wide Web. Those who have used nematodes stress the importance of following the directions supplied with the product, particularly concerning soil temperature and expiration time. Soil temperature can be measured with a soil thermometer available at most garden stores. As with other control measures, the applications will have to be done on a yearly basis. Hank Helm is a member of the Kitsap Chapter.